Who Are We Keeping Out? The best thing about taking to the roads is that we see things we are not supposed to see; this happened to me driving t hrough southern Arizona, a few miles from the Mexico border. Right away I began to notice white border patrol cars lumbering along the dirt roads that parallel the highway. A low-flying plane droned overhead. In the distance, a strange black smudge snaked across the desert; it’s the fence the Federal Government is building, about half of which is, or will be, in Arizona. 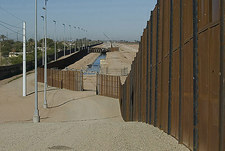 Under Bush, 601 miles of the fence were built; 69 miles remain to be completed, and President Obama has yet to rescind the order. Driving east, we were stopped at four checkpoints and pursued once for “evading our checkpoint”—we were looking at a map. All five times, the border patrol officers took one look at us and passed us through. After all, we are white. Now that the former governor of Arizona is in charge of so-called Homeland Security, can we hope for a review of this project? Janet Napolitano has quipped, “Show me a fifty foot fence and I’ll show you a fifty-five foot ladder.” She knows something about the determination, as well as the desperation, of people trying to make it across. Some die on the way, from overexposure in the desert. In fact, deaths have increased since the border towns have become so heavily policed that Mexicans more frequently try to make it across through the desert. Others suffocate in the back of trucks, now often manned by drug trafficers. I’ve heard that Mexican women immigrants now take birth control pills before attempting to cross because they know they will be raped on the way. Our response? New heat-sniffing equipment for the border patrol that finds these hidden immigrants and sends them to detention hell in places like Las Cruces, New Mexico, where they are held incommunicado for months, with no legal representation, no visits, and no information about their whereabouts for family and friends, until they are dumped back over the border. In Santa Fe, nearly all of our outdoor work, construction, ditches digging, is done by Spanish-speakers. They live often in wretched conditions in trailer camps south of town. This is true all over the country, from the fruit picking in California to the chicken picking in North Carolina. Our solution? Start fining the people who employ them. When will we recognize both our need for, and our responsibility to, people who still want to find what this country used to promise: work, and freedom? When will more than a handful of tourists see the dark-skinned people who stand by the side of the road in Arizona, pulled from the cabs of their pick-ups, cross-questioned by nice blond young border patrol officers, while we, the white-skinned, sail through? Is there really a chance that the racism that is endemic in this country will be reexamined, now that the great great granddaughter of slaves is our first lady?